Hrmmm, let's see. Pennsylvania, Ohio, Maryland, New Jersey, New York, Maine, Massachusetts, Indiana, California, Utah, and now Michigan. Sandy and I have started a somewhat odd tradition of checking out Trader Joe's in different states when we have the chance just, well, because, I guess. As Pennsylvania residents under the regime of olden blue laws, there's some obvious privileges to out of state trips (especially NJ), but that's not completely it, either. There's the little, smaller differences, the unexpected stuff that makes it a little fun. Prime example: our trip to the Salt Lake City store seemed like it'd be ho-hum until it turned into perhaps our most memorable ever (you can hear the full story on our first podcast episode here!). Or sometimes it's just finding stuff that the local TJ's don't carry, like my favorite store bought tortillas which every TJ's except Pittsburgh carries, apparently. We tacked Michigan on to our list with a stop at the Royal Oak store last week right before a Detroit Tigers - Pittsburgh Pirates game to grab a quick bite without being gouged at the stadium* and to procure some goodies to keep our adult and kiddie tummies happy for the night and next day for the way back home. Huuuge store there, biggest I've been in - almost the size of a regular grocery store! A stroll through the baked goods revealed the Trader Joe's Inside Out Carrot Cake Cookies, and having never seen them anywhere else, we couldn't resist. An excellent call. I've always been a sucker for those Little Debbie oatmeal creme cookies, and these are in a very similar vein, except better. The cookie portion is a pretty classic carrot cake confection - shredded carrots, with some ample raisins and I swear there walnuts in there, too, even though they are not listed on the ingredients list....maybe I'm making that up, but if nuts are a concern, doublecheck before buying these. Of course, since the cookie has to do it's part to hold together with some cream filling, it's a little more rigid of a texture to the bite than regular carrot cake, but still, it's soft and chewy and fairly delectable in its brown sugary-cinnamony-carroty goodness. The sweet vanilla cream filling is pretty good and refreshing, as kind of an odd choice, perhaps. There's part of me that would have really liked more of a cream cheese frosting filler, but that'd make a pairing that's been done over and over again, so I'd like to say that vanilla was an inspired choice...but it's vanilla. Granted, it's really good vanilla, and definitely sweet, and melds well with the carrot cake cookies, but if going for something different than the tried-and-true. go all out. Maybe something like butterscotch and pecans. Vanilla's playing it pretty safe, I guess. Speaking of nuts, that's what the product name drives me. 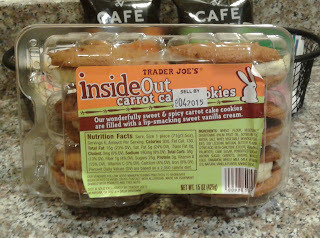 There's nothing "inside out" about these cookies....because primarily, first and foremost, IT"S A COOKIE. 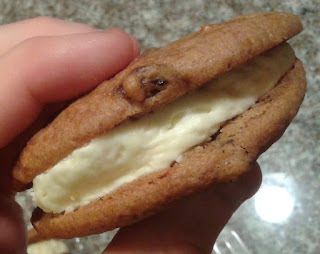 Sandwich cookies are supposed to be exactly of the same structure as these - cookie outside, cream filling. It's cake inspired, and not a cake, where it's the frosting on the outside and cake inside the frosting. 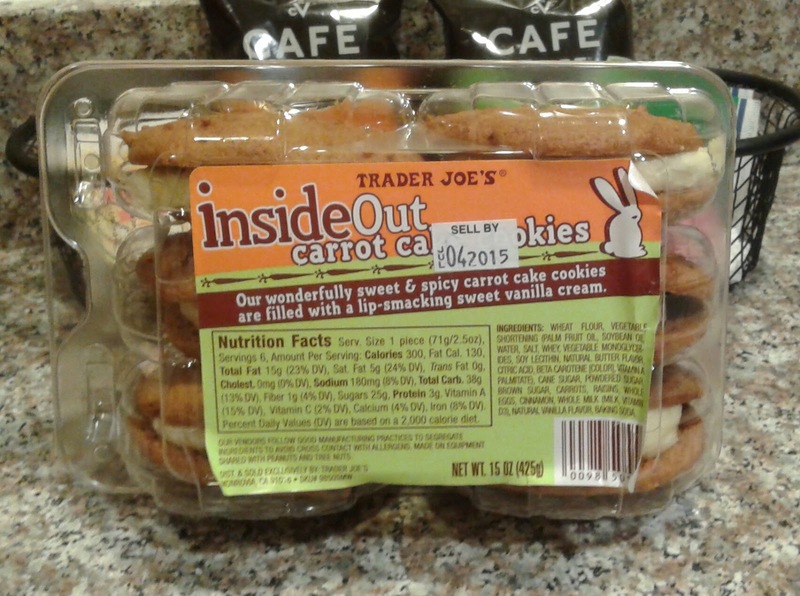 Maybe they were just naming these as "inside out" cookies in some sort of weird attempt to get a crossover marketing ploy with Eve 6, I don't know. Anyways, the wife, the toddler, and I all greatly enjoyed these cookies. The six pack cost us something like three or four bucks, which for a bunch of tasty cookies the size of these is a pretty good deal. I mean, look at the picture...these are big cookies with a huge swath of filling. On a few occasions I had only half of one, which was more than enough. Sandy gives them a four, noting she also wishes the filling was a different flavor while acknowledging its tastiness, while I concur with her assessment completely. just hope we don't have to drive back to Michigan to find them again. * Quick note: Comerica Park - what a stadium! I've been to at least a dozen different ballparks now, some of them pretty ho-hum (like Nationals Stadium in DC or Citizens Bank Park in Philly), while Comerica Park rivals maybe only PNC Park here in the 'burgh for overall awesomeness. Loved the tiger statues, and as a family we also really enjoyed the carousel and baseball Ferris wheel. PNC Park has a clear location/viewing advantage - from inside the stadium you can easily look out over the Allegheny River, the Clemente bridge, and right into downtown Pittsburgh where when the evening light hits it just right, it looks unreal. Kinda better than just glaring at Ford Field. - but other than that, and some hometown pride, Comerica is just as good if not better. So it like Little Debbie but healthier? I should give it a try! We have those in TX. I love them! Vanilla being used in place of cream cheese frosting/filling is one of my biggest peeves in life. These cookies have changed and NOT for the better! They used to be huge and stuffed and actually look like carrot cake slices. They arent even a shadow of what they used to be even just 2 months ago! Trader Joe's needs to change them back ASAP! I just got my first package of the "new" cookies. It will be my last. The cookie is very dry, the filling got thinner and the filling just tastes like a very cheap ,very sweet vanilla frosting. A good product gone bad. Were the cookies reviewed the "new" cookies?